The blog is back in operation. Thank you for your patience. Having watched the Crew all spring and the first two weeks of the season, I’m starting to think this will be a streaky team. Ron Roenicke is hoping a more aggressive style will keep them a little more consistent (not always waiting for the homerun) but so far, this team seems like an up and down group. The offense can be explosive but, as in years past, they seem to struggle against pitchers above bat speed (hard throwers) and below bat speed (kitchen sink’ers). I love the “attack” style of play. Many say it’s the “Angels way” but having seen Roenicke manage in the minor leagues (1997-98, San Antonio), this style is exactly the way he managed back then. The aggressive base running, the shifting, the “out-of-the-box” thinking was formulated by Roenicke and Mike Scioscia during their playing days with the Dodgers in the 80’s. The process continued when those two were coaching in the Dodgers minor league system in the late 90’s. I would venture to say that Roenicke had as much influence on the style of play adopted by Scioscia in Anaheim as anyone. It is a very similar style of play as the Rays under former Angels coach Joe Maddon, Charlie Manuel’s Phillies, John Farrell’s Blue Jays, and of course, the Angels. I love it. It certainly makes for entertaining TV every night. Running game: It is simple math. Add the time it takes the pitcher to throw to the plate plus the time it takes the catcher to throw to second. Compare that with time it takes for the individual Brewers base runner to make it to second and make the choice. There are no secrets. You’ll see 1B coach Garth Iorg talking to runners in earshot of the first baseman with those numbers. If the math works out, the Brewers will run. Double Switching: Don’t expect many double switches. 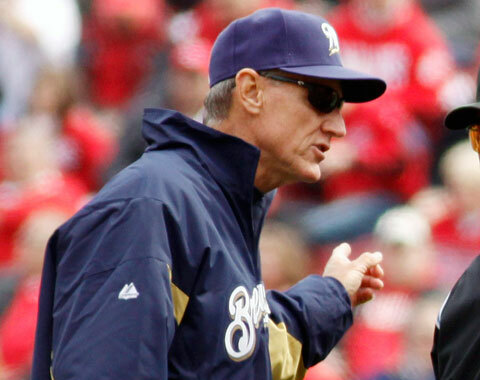 Roenicke told me he subscribes to the Whitey Herzog philosophy concerning the double switch. He’ll ONLY double switch when he needs multiple innings out of a reliever. He does not like getting locked in the batting order. He’ll always keep as much flexibility as possible with pinch-hitters unless he absolutely needs multiple innings from a reliever. Shifting: Roenicke was in charge of setting the defense in Anaheim and while Scioscia didn’t apply the same degree of shifting as we’re seeing now, it was always a big part of the defensive philosophy. If you see a shift, there is an overwhelming trend with that hitter according the spray charts. Hope this helps you get to know what the manager a little better. Whether you agree with his philosophy or not, you can’t say the man doesn’t put serious thought into his plan.